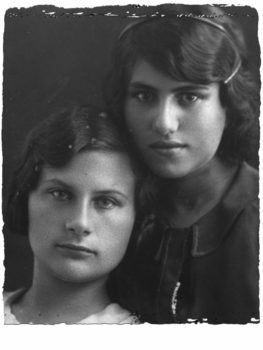 Pyatigorsk, Soviet Union… 1942 – When the Germans announced that they would be relocating the Jews from the town, Kira and Dmitry Belkovi came to say goodbye to their friends, the Litovsky family. Masha Litovsky, a classmate and close friend of Kira, feared the worst and asked her friends to hide her. Kira and Dmitry took Masha home and asked for their parents’ permission to save their friend. The risk was great but they could not let Masha die. That night, the entire Jewish population of Pyatigorsk, Soviet Union (now Russia), more than 6,300 men, women, and children, were loaded on trucks, taken to the woods and murdered. Masha’s older sister, Fira, managed to escape from one of the trucks and came to the Belkov home seeking shelter. The two sisters were hidden in the cellar. Kira and Dmitry took care of Masha and Fira, sharing food and clothing with them. It was, however, too dangerous to keep two Jews hidden. Mr. Belkov helped Masha and Fira escape to the town of Armavir where there was another family, the Zagurskis, who agreed to give them shelter and where their chance of survival was greater. Dmitry Belkovi passed away in 2002. Kira Belkova died in 2004.